Blogger’s note: There is a mixed-reaction towards Facebook Instant Articles, particularly on the issue that Facebook will be implementing stricter rules for users of this feature. While there is a growing concern that it would be challenging to maintain this feature, Instant Articles is still worth a try. Read on to know more about Facebook Instant Articles and see how it can help your business, and if it will be worth the extra effort. Social media has proven over the years that its worth is not limited to connecting people together, but also connecting consumers to businesses. Social networking sites such as Facebook has helped drive its users to business websites, and in the process, helping convert these visitors into customers. One of the best ways for which Facebook has helped in reaching out to potential customers is by providing a platform for content, and not only is it easy to post content, it’s also easy to be spread out to readers. If the content has quality, it will be liked, shared, and commented upon, engaging a large number of Facebook users, and growing the number of potential customers exponentially. Photos and videos are also some great ways to engage Facebook users, and these methods have proven to be very effective, and to a certain extent, can even deliver better than regular posts. There is a relatively new way to use Facebook, but its potential has not been utilized to its full capacity by businesses. Launched in 2015, Facebook Instant Articles help provide a way for website content such as articles be easier to push into Facebook. Facebook’s Instant Articles feature allow website content to be opened in the Facebook app instead of directing users to external websites. Doing this helps push businesses’ content easier, and in a faster manner. Loading websites outside of the Facebook app takes more time, and the prompt from Facebook that you are being sent to an external site adds to the hassle. With Facebook Instant Articles, the content from the site can be opened directly on the app, making things more efficient. Aside from loading speed, the Instant Articles feature helps optimize content for the users. Sidebars and menus are removed, fonts and layouts are made simple, and helpful objects are allowed while distracting ones are eliminated. Facebook Instant Articles focuses on improving the readability of the content, ensuring that the message is conveyed in an efficient manner. While there is an undeniable improvement in terms of content, there is an unresolved debate whether or not the Instant Articles feature lessens the ability of businesses to drive users to their site. Facebook has already made amends with this issue though by allowing the integration of native videos and carousel ads, and allowing the full monetization for these as well. Facebook Instant Articles are not made to replace the need to optimize content on your own site – it’s there to complement it and the improvement of your content’s readability is a testament to it. You should at least give the free trial a go to see whether Instant Articles will be helpful for you or not. It is highly recommended for sites that release content regularly. 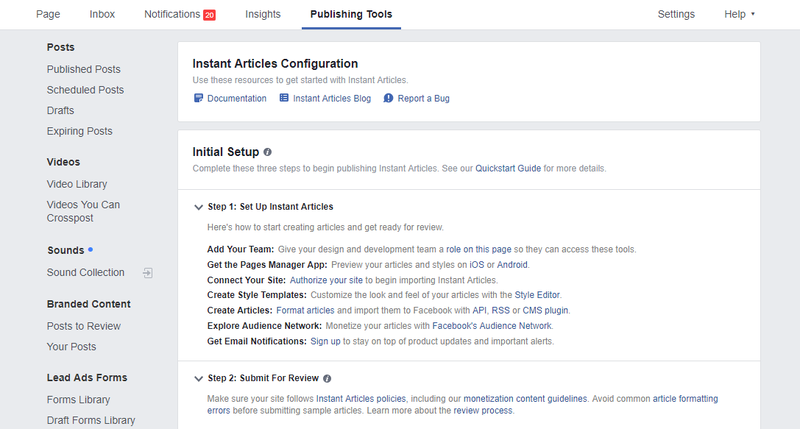 We are providing you the steps you should take in order to get you started with Facebook’s Instant Article feature. We hope that this detailed guide can help you make your content more successful in reaching your intended audience. Facebook Instant Articles was made to help make businesses convey their messages and ideas in a better manner so it is great if you can give it a try. Instant Articles was made in such a way that you would not need additional software to have it work. You can also integrate your existing content into it. Facebook will parse the RSS and HTML of your WordPress site for you, and then convert the content into Instant Articles. You may use specific tags for Facebook to make use of rich media and features. Please note though that not all WordPress shortcodes, as well as custom content, can be automatically translated to Instant Articles. Some additional rules may be required in order to put them up into Instant Articles. While this may take a little effort, it will definitely pay up as your content will have more potential for engagement. It is required that you have at least five articles on your WordPress site before you start with Facebook Instant Articles. Go to WordPress’ Plugins, then select Add New, then search for Instant Articles. Install only the official plugin, and then activate it. After doing that, go to Facebook then sign up as Instant Articles creator. Before you get Instant Articles running, there are a few things you’ll need to do. First, you need to have admin access to your business’ Facebook page. You also need to be aware of Facebook’s Content Guidelines in order to monetize your content. The very basic of it is that you should post regularly and maintain a decent following. 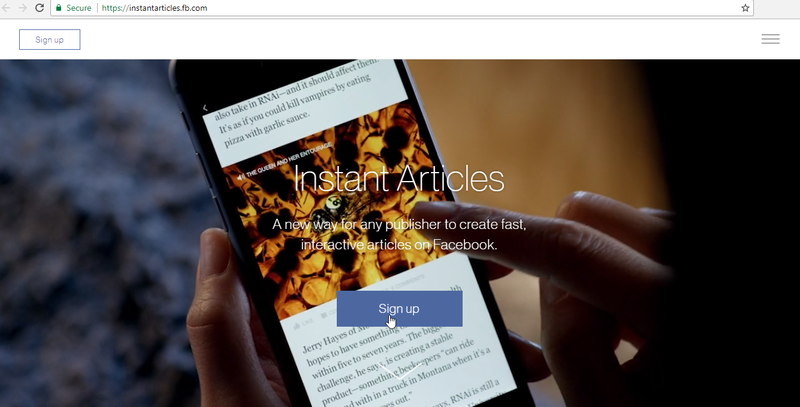 To sign up for instant articles, go to instantarticles.fb.com and press the sign up button. Select your business’ Facebook page as the one you want to use the Instant Articles feature for. You will be redirected to the Instant Articles publishing tools page. Afterward, authorize your WordPress site to import articles to Facebook. A code will be given to you which you should paste into your Plugin Page ID setting. Go to your WordPress dashboard, and paste it there. Save the changes after. After saving, return to the Facebook publishing tools page then enter the URL of your WordPress site. Press “Claim URL”. There should be a confirmation message that your site’s UR: has been claimed successfully. Upon installing the plugin for Instant Articles, your site should have an Instant Articles feed. You should paste the URL of your WordPress site’s instant articles feed to your Production RSS Feed under your Facebook settings page. Remember that at least 5 articles are needed before you can submit your Production Library for review. You will need to manually go to your existing articles on your WordPress site to import them to Instant Articles. Just click on the update button. But for any new article, this will be imported automatically. You will be able to customize your Facebook Instant Articles. Go to your Facebook page, then go to the Publishing tools in the admin bar. Click on the Configuration option under Instant Articles. Under the tools section, you find the Style tab which you can expand. While Facebook already has a default style for you, you can customize it. You should add your company’s logo. You would not be able to submit Instant Articles unless you put in a logo. Just be mindful that Facebook is requiring images that are at least 690 by 132 pixels. Your logo should also be transparent and in PNG format. Other things that you can customize are colors, as well as text styles. Always remember to save whatever changes you made in order to apply them. You can get a preview of your Instant Articles before publishing them. Install the Facebook Manager app on your phone first, then sign into your Facebook account to pull out your account information. Press the “…” option at the bottom to find the Instant Articles link. You’ll then see a list of Instant Articles under the Production tab. Clicking on each one will show you a preview. You may also want to check on the Examples tab to check on sample articles, as well as gets some tips on creating Instant Articles. Once you’re done with setting up the aesthetics of your Facebook Instant Articles, you should submit it for Facebook’s review. Simply click on the “Submit for Review” button and wait for feedback in three to five days. Once you get the approval, you will then be able to publish Instant Articles. You might run into some trouble along the way of setting up. Certain issues arise for various themes and plugins on your WordPress site. Some of the common errors are due to unsupported plugins or themes that prevent your content to be transformed into Instant Articles. You would need to set your own transformer rules to resolve the issues with such plugins or themes, but as this is quite complicated, it is recommended that you remove such content blocks by configuring your plugins and themes. Another common issue is getting an Empty Feed error when you submit your Instant Articles feed. Check whether you provided the right URL. The simple presence or absence of “www.” can be an issue so double-check your WordPress setup, else, you’ll get a 404 error. Still seeing an empty feed error? Simply updating your last ten posts may do the trick. This post was written by Henry Hernandez. He is the leading strategist for a Dallas SEO service company, a Christian Internet Marketing Company, which aims to take your digital marketing strategy to the next level by bringing in a holistic Christian marketing approach for sustained growth in market saturation. Thanks for sharing this article. It’s very helpful and inspiring. Actually, This one is a very nice piece of content. I’ve been researching lately about FB instant articles. For me, It looks exactly the same as Google initiative with AMP. The same idea to keep readers on their platform instead of redirecting them to other websites. I think they’re keep forcing us to turn into Paid Advertising to generate traffic. Organic Results keeps getting limited and limited! However, it has taken more time than that I guess. And I am still waiting for its approval. Thanks a ton for this post and clearing some of my doubts.